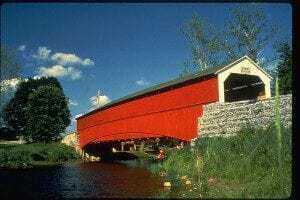 Step back in time by taking a Covered Bridge Tour…. As you cruise along the roads of Berks County, turn the clock back more than a century in your mind. Picture yourself in a driving snowstorm, your ice-cold hands gripping the reins of a one-horse sleigh. Imagine turning your rig onto the Dreibelbis Bridge, the runners grinding onto the dry wood, ripping the reins from your fingers as the sleigh suddenly lurches forward…..
Dreibelbis Bridge was built in 1869 by the great grandson of John Jacob Dreibelbis, Simon H., a stone mason and carpenter who constructed a number of stone-arch and wooden covered bridges. The bridge was built for an estimated cost of $6,000. Its wood was brought to the site by the Schuylkill River and Lehigh Railroad. Thanks to rail traffic, the area became known as Dreibelbis Station, though little of the railroad remains today. Manassas Dreibelbis was a promoter to construct a bridge at this site. For, to cross the Maiden Creek to reach Virginville or Lenhartsville, wagons had to go upstream a good distance where a ford was located. He and others petitioned the County Commissioners and, after inspection and study authorized its construction. In 1976 it was placed on the National Register of Historic Structures. 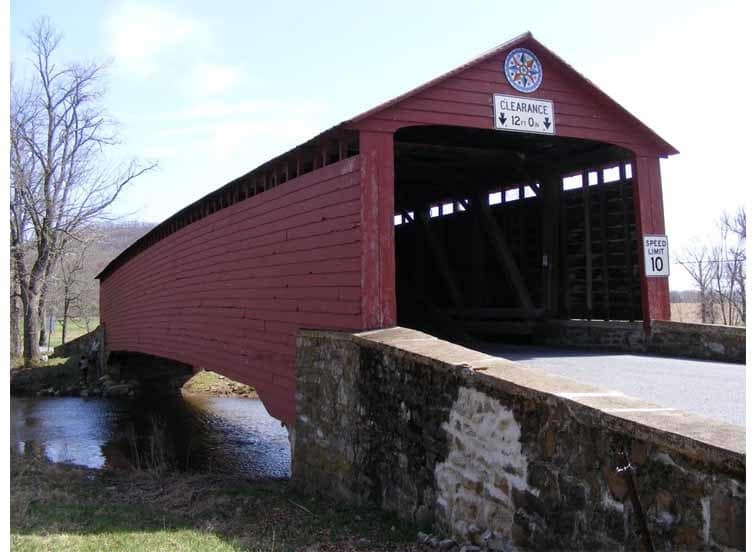 Griesemer’s Mill Bridge is thought to be the oldest covered bridge in Berks County. 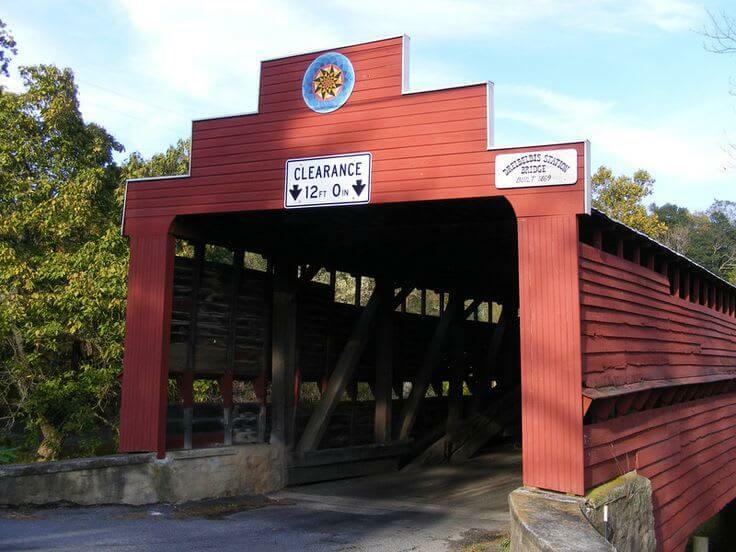 Greisemer’s Mill Bridge is a historic wooden Covered bridge located in Oley Township, Berks County, Pennsylvania. It is a 124-foot-long (38 m), Burr Truss bridge, constructed in 1868. It has a gable roof and stone abutments. It crosses the Manatawny Creek. It was listed on the National Register of Historic Places in 1981. 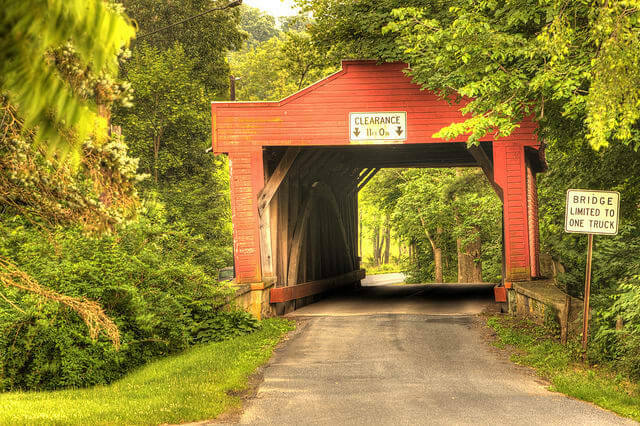 Kutz’s Mill Bridge is a historic wooden covered bridge located in Greenwich Township in Berks County, Pennsylvania. It is a 93-foot-long (28 m), Burr Truss bridge, constructed in 1854. It crosses the Saucony Creek. It is one of five covered bridges remaining in Berks County. It was listed on the National Register of Historic Places in 1981. The Pleasantville Bridge was built in 1852 by David Renno, Jonathan Bitner using the Burr truss design. The structure crosses Little Manatawny Creek, the length is 128 ft. and the width is 16 ft. This bridge is open to vehicle traffic, it is owned and maintained by the state of Pennsylvania. The bridge has been refurbished and is in excellent condition. It is located on Rt 1030. Covered Bridge Road south of Pleasantville, approximately 0.5 miles south of State Rt. 73 in Oley Twp. The GPS location is N40 22.73 W75 44.33. 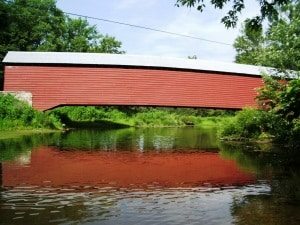 Wertz’s Covered Bridge, also known as the Red Covered Bridge stands as the longest single span covered bridge in Pennsylvania, stretching 220 feet across the Tulpehocken Creek, located in Bern Township and Spring Township in Berks County, Pennsylvania. The Burr Truss bridge was constructed in 1867 and crosses the Tulpehocken Creek. It serves as the walkway entrance to the Berks County Heritage Center, which also includes the Gruber Wagon Works. It is one of the five covered bridges remaining in Berks County. The bridge was rehabilitated in 1959, however, when the Warren Street Bypass opened the bridge was closed permanently on October 23, 1959. It was listed on the National Register of Historic Placed on November 1978. From June until December 1984 the bridge was restored. The siding was replaced, several floor boards were replaced, it was jacked up, realigned, tightened, camber restored, and the rotted arch ends were replaced along with cedar roof shingles.